Climate change is a worldwide problem. Access to clean air, water and food affect each and every one of us regardless of race, class, gender, immigration status, sexual orientation or political affiliation. For the sake of all humankind, we must unite globally and act locally to confront the most urgent issue of the 21 Century. Staten Island, NY home of Freshkills Landfill, Brookfield Landfill and other areas of toxic dumping, has been on the frontlines of man-made environmental crises for decades. In 2012, the citizens of Staten Island experienced first-hand the effects of climate change during Super Storm Sandy when the ocean surged, destroying homes, businesses, and most tragically lives. Staten Island was hit particularly hard by the storm; 24 Islanders lost their lives, and thousands of people were uprooted from the destruction. Nearly 5 years later, many Staten Islanders are still struggling to rebuild. On April 29th, Sustainable Staten Island, Move Forward Staten Island, and a broad coalition of labor unions, immigration rights groups, environmental justice and community organizations from throughout New York City will stand together in solidarity to demand climate action now on the federal, state and local levels. The Staten Island March will symbolically be held in an area heavily impacted by Super Storm Sandy in remembrance of the 53 New Yorkers who lost their lives during the storm. 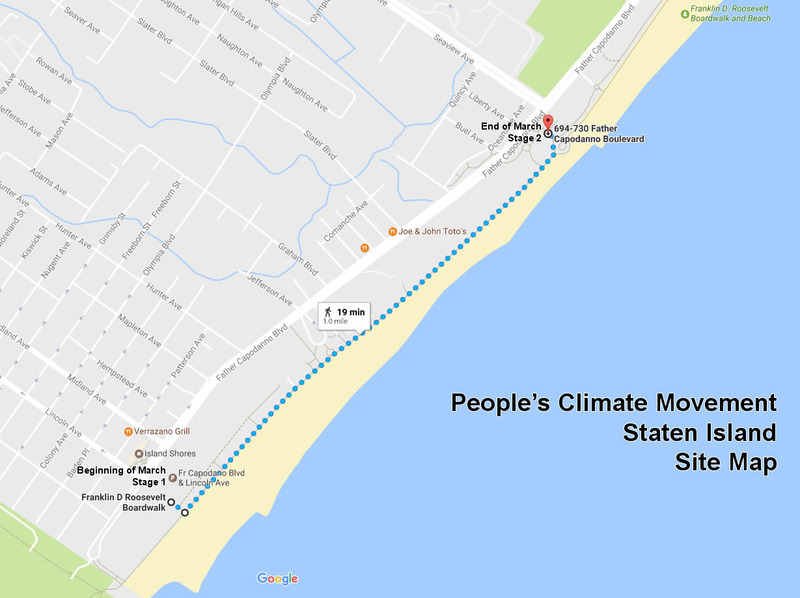 If you can’t make it to the national People’s Climate March in DC, taking place the same day, join us on April 29th at 12pm at the South Beach Boardwalk, Staten Island. Let's put partisan politics aside, and march together to collectively raise our voices to bring focus onto environmental and climate issues. Our future quite literally depends on it. Are you ready to march! Here are some pointers to help you make your day fun and peaceful. 1. Please consider bringing your own picnic! There aren't many food options available and there is plenty of room to lay out a picnic blanket or portable chair and chill out. There will be water available but you should bring your own if you can. 2. There will be an art table set up at the beginning of the march complete with poster paper and markers for you to create your own signs and art. Please feel free to contribute or donate supplies and your time. It starts at 11:15am at the Lincoln Avenue picnic area. 3. Bring your musical instruments! We are encouraging people to bring musical instruments to the march and to lead sing alongs , drum circles and chants! Let's have a beautiful day of solidarity, love and peace! Our resistance depends on it!